These are the most popular Japanese confectionery. They are made from glutinous rice and wheat flour. The dough is stretched thinly into circles or squares of about seven to eight centimeters, or put into molds, then baked; taste is supplied by baking it with soy sauce applied or by mixing it with sesame and salt. Senbei were perfected in the Edo Period(1603-1867) and there are various kinds throughout Japan. 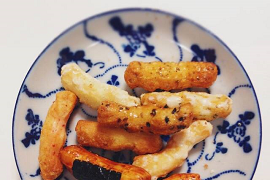 Thinly-cut, dried rice cake called kakimochi is considered one kind of senbei.